Like most enthusiasts of Shakespeare’s works, (as with opera aficionados) one rarely demonstrates the ‘been there, seen that’ aphorism… every performance is unique. These eyes (and memory) have relished seeing, even studying HAMLET; the epitome of classical tragedy. I’ve seen the protagonist as despondent; as depressed; even as suicidal, but director Antoni Cimolino’s current vision has Jonathan Goad displaying hesitancy and undecidedness, then a metamorphosed self-sanctioning of his course of action. This certainly IS a Hamlet with whom that this scribe can identify. Cimolino has chosen to date the play circa 1920, a period of stagnated WW -1where the political machinations that brought about the war were still kept secret. Was the Archduke’s assassination really cause for such a conflict? Was there an Industrial/military complex even then? Was colonial expansion foundation for over 37 million military & civilian casualties? Was a Danish throne and a sister-in-law sufficient basis for fratricide? Neither Shakespeare nor Cimolino offers rationalization, but the story itself is adequate enough for such a Stratford treatment and the analysis is both erudite and theatre at its best! The plot – a revise of the biblical Cain/Abel account in Genesis, has Claudius claiming Gertrude, the widow of Hamlet Sr. and Queen as his wife; thus becoming king. His nephew – is made aware of the poisoning of his late father and who may be the assassin by his late father’s ghost. Dad entreats Hamlet to ‘Remember Me’ which might mean to extract retribution on his uncle and even on his mother for compliance. A doomed relationship with Ophelia whose father is Lord Chamberlain (in this version, he’s also a priest) ends with both their deaths as do the three antagonists. A challenge for every thespian is having to recite dialogue whose familiarity boggles the mind. Who can’t recite “To thine own self be true”; Polonius’ advice in Act I; or consider ‘To be or not to be” as must Hamlet. The counsel that one should “Neither a borrower or lender be” flies in the face of both VISA™ & MasterCard™ but is definitive instructions given today’s economy. The opinion that “What a piece of work is man” certainly reflects on our current Duffy trial as does the Act III statement that “The play’s the thing”. The only excerpt this scribe avoids is Polonius’ Act II, scene 1 declaration the “Brevity is the soul of wit” Not so, I’m paid by the word. 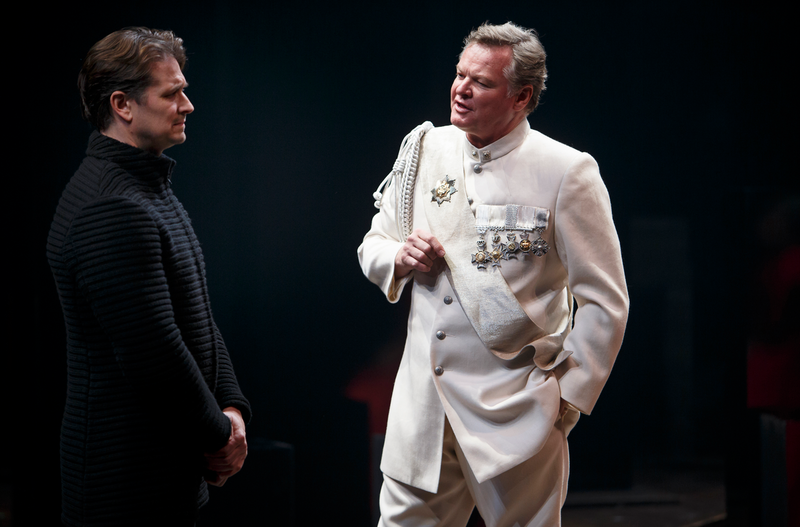 As Hamlet, Goad epitomizes the struggle one has with oneself. No other antagonist can be as emotionally intimidating. The man brings such intensity to his portrayal that the audience HAS to either personally identify with the character or else know people who have also endured this dichotomy of feelings. Claudius is rendered authentic by a dynamic Geraint Wyn Davies who is human rather than all black. The characterization is more shades of grey and this more credible. He and a powerful Tom Rooney as Polonius bring strong visceral renderings, not only to the dialogues but the interpretive acting that fleshes out their on-stage personalities. The playwright’s creation of ‘Ophelia’, like his Juliet or Desdemona, is a desirable yet challenging role for any actor. She must earn the audience’s empathy if her eventual demise is to have meaning. Opera heroines’ glean this compassion by the 3rd scene but that is usually the result of amazing arias or mood-setting themes. Thespians achieve it by their acting. Adrienne Gould (and those cheekbones) almost immediately captivates her audience. The beleaguered queen – Seana McKenna is both regal and maternal and as always, brings that certain class to role interpretation. Steve Ross & Sanjay Talwar manage their Guildenstern/Rosencrantz portrayals with reverting to ham or buffoonery. As the hero’s supportive friend Horatio; Tim Campbell brings veracity to his reading and especially his finale – “Good night, sweet prince; and flights of angels sing thee to thy rest”. It leaves the Norwegian prince ‘Fortinbras’ to order his troops to- ‘Bear Hamlet like a soldier to the stage’; a fitting end for a hero and a sensitively emotional end to a magnificent play. This offering will surely earn yet another O.A.R. Top Ten inclusion for Stratford. HAMLET is at the Festival Theatre until October 11th. Definitely see it!! !